I’m taking a page from the playbook of the tech podcasters that my husband, Jeff, listens to and I’ve decided to begin using a service called Patreon to secure funding for my podcast. It’s simple. 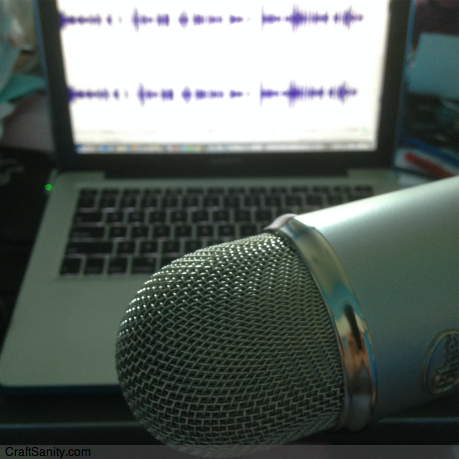 Do you get value in the CraftSanity podcast? Would you be willing to pay $1 a month to support it? Then here’s an easy way to do it. Create an account at Patreon.com and then visit CraftSanity’s Patreon page and pledge a $1 a month (or more, but we are only asking for $1). That money is automatically paid monthly to support the CraftSanity podcast’s equipment and service fees, such as Skype and Soundcloud. Here’s a 1 minute video explaining how it works. Note we aren’t asking a fee per podcast, just $1 a month. I love the fact that I produce a free podcast and have done so since 2006. I want to continue that model because I believe in giving everyone access to the shows I record. Through the years the CraftSanity podcast has entertained commuters and connected people working independently in their studios and kitchen tables with kindred spirits around the globe. The show has done this while simultaneously introducing the art and craft world to artists and crafters launching new businesses, promoting books and telling the handmade stories that make life so fantastic. I seek interviews with people who follow their bliss, people who commit to keeping the dream alive, the ones inspired to take that leap of faith because it seems that nothing else can satisfy them. Creative types are the ones who ask “what if?” and then set about the task of finding out what happens next. I’m one of those people and I’ve spent many hours interviewing, photographing and writing about these folks because they inspire me and I want others to get a chance to hear their stories, too. It has never been my intention to get rich producing a free podcast and I certainly didn’t anticipate that the experience would change my life so dramatically. Producing CraftSanity has led me to meet and collaborate with some fantastic people around the globe and I’m very grateful for those opportunities. Now I want to raise the stakes. I want to podcast better and more often. Jeff (the tech expert and podcast co-creator behind the curtain) and I have never put our full effort into the podcast because it’s never generated any income. I’ve had lovely advertisers who have helped cover web hosting costs, but even with their generous support, I’ve never gotten “paid” to produce the show. So why do I still want to do this? Because I feel like it’s something I was born to do. I struggle with my fair share in life, but I’m good at helping people tell their stories. It’s one of my strengths and I thoroughly enjoy it. And while I consider it a privilege to get to interview people about their lives, I’ve decided that I also need to stop devaluing my own product and experience. CraftSanity can remain a free service without me having to do all the work for free. I don’t want to sell out to corporate American and annoy listeners with obnoxious ads, so I’m going to try Patreon and see what happens next. Today, I’m calling on my audience to support my podcast and chip in whatever you think it’s worth, $1 a month, a quarter a show. You decide. And, of course, the show will remain free no matter how much or little support I receive. So if you don’t have an extra quarter to drop in my virtual tip jar, no worries. I still want you to listen and get inspired. That part won’t change. I just can’t help but think that CraftSanity could be better for all of us if I can get the opportunity to give this podcast the attention it deserves. So, I’m going to try this new funding model and see what happens. If it succeeds, I’ll be over the moon and podcasting up a storm. If it fails, I’ll figure something else out. I always do. No matter how all this shakes out, I want to thank you for taking the time to read this awkward post and for inspiring me to keep doing what I do. I simply desired to thank you so much yet again. I do not know the things that I might have used in the absence of those tactics revealed by you regarding such a area. It had become an absolute intimidating setting for me, nevertheless considering the specialised manner you handled it forced me to cry for joy. I am thankful for your advice and as well , hope that you recognize what a powerful job you have been putting in training other individuals by way of a site. I am certain you haven’t met all of us.